Sign announcing the 90 Miler. 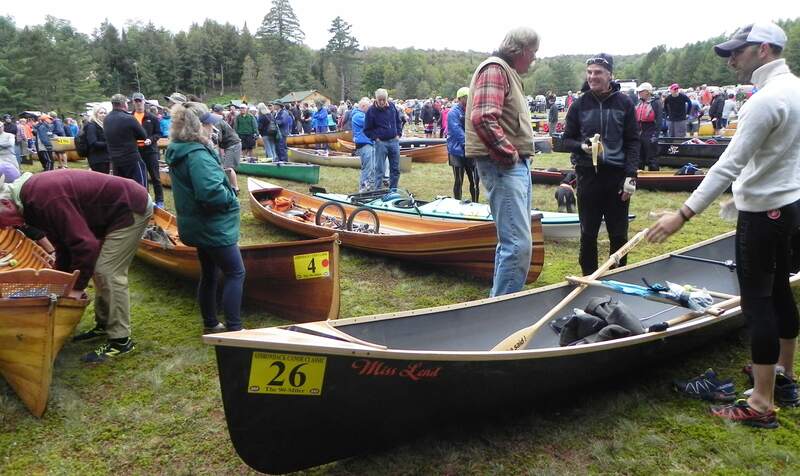 On this weekend every year the Adirondack 90 mile canoe race is run. 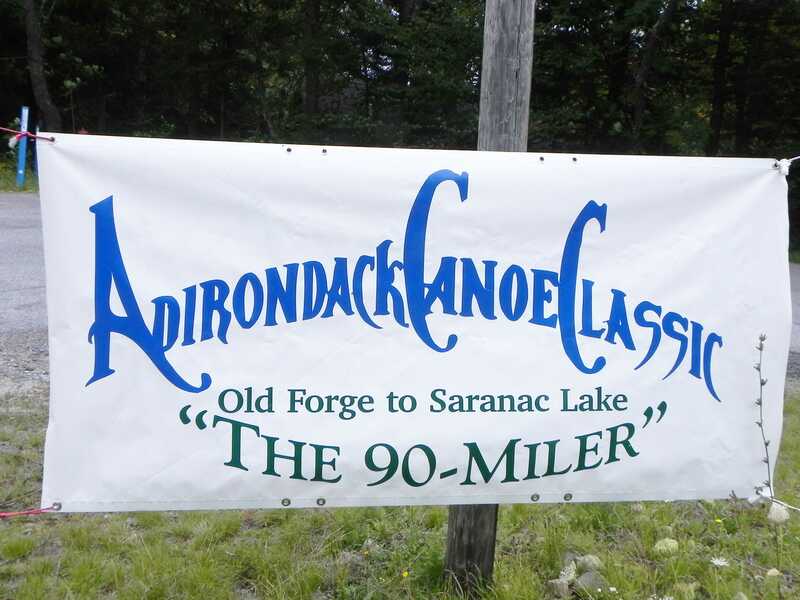 The race starts in Old Forge, NY and ends in Saranac Lake, NY. Since the second leg begins literally in my backyard, I will check it out. Two of my friends, John and Jon, are in the race so I will see how they are doing. Our neighbor, Tom Bissell, graciously allows his field to be used as a staging area. There are probably 500 contestants who hale from all over the US and some foreign countries. The racers start arriving shortly after the finish of the first leg yesterday and soon Tom’s field becomes an impressive parking lot. I head out early looking for the guideboat racers. There aren’t many but they are a hardy crew. Here are some of them. Some of the guideboat racers in the 90 Miler. Note the wheels in one boat to help get through the Raquette Falls Carry. Here is another guideboat racer. He looks fresh and ready to go. 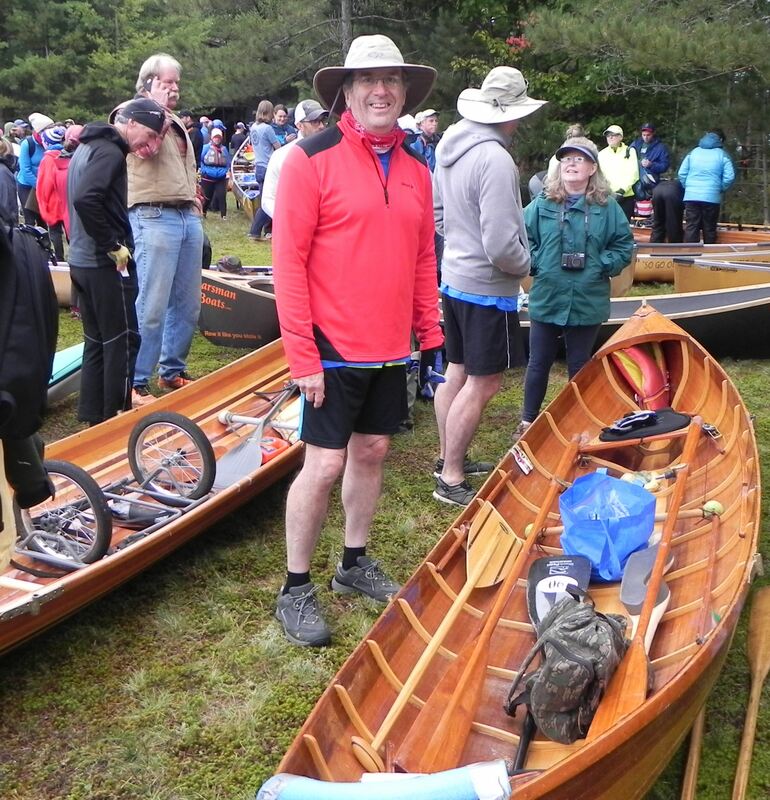 A 90 Miler guideboat racer. I come upon Stephanie and her Dad, Steve. They are the only ones racing in a traditionally built guideboat. Stephanie tells me the boat is over 100 years old and she will be retired after this race. I was impressed with what fine shape their boat was in. 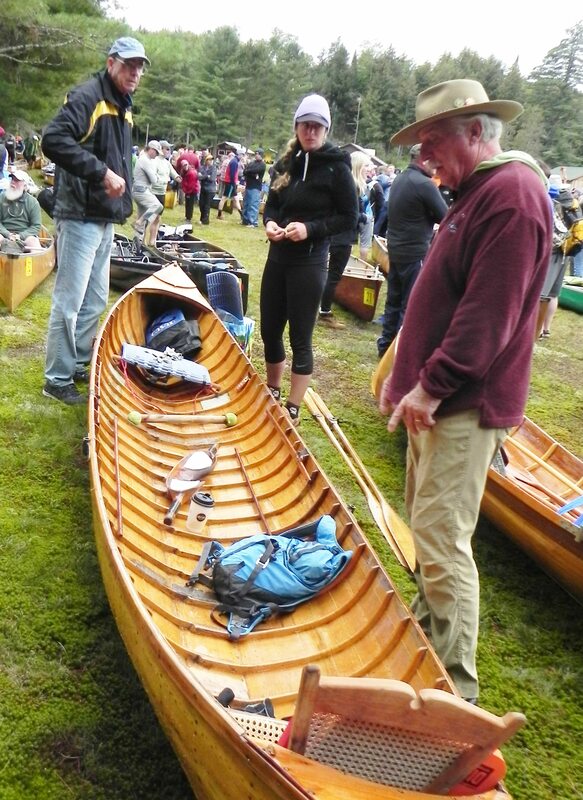 They believe the boat was built by John Blanchard of Raquette Lake and wonder who might help them identify the builder. I suggest Hallie Bond , the former Curator at the Adirondack Museum. Here are Stephanie and Steve beside their boat. Stephanie and Steve with their boat. I find John with a friend of his. They are talking about the rigors of the first day’s race. This year water levels are quite high due to the abundant rainfall we’ve had all summer. This meant traversing Brown’s Tract was made that much more difficult. The greater flow in this serpentine stream was a bigger obstacle for the racers and the turns seemed sharper. Brown’s Tract is only a mile long as the crown flies but is three miles long as a boat goes. Guideboats find Brown’s Tract quite daunting because the creek is only five feet wide in some spots. The “wingspan” of guideboat, counting its beam and oars, is about 16 feet. Guideboaters talk about “crabwalking” their boat through portions of the Brown’s Tract. 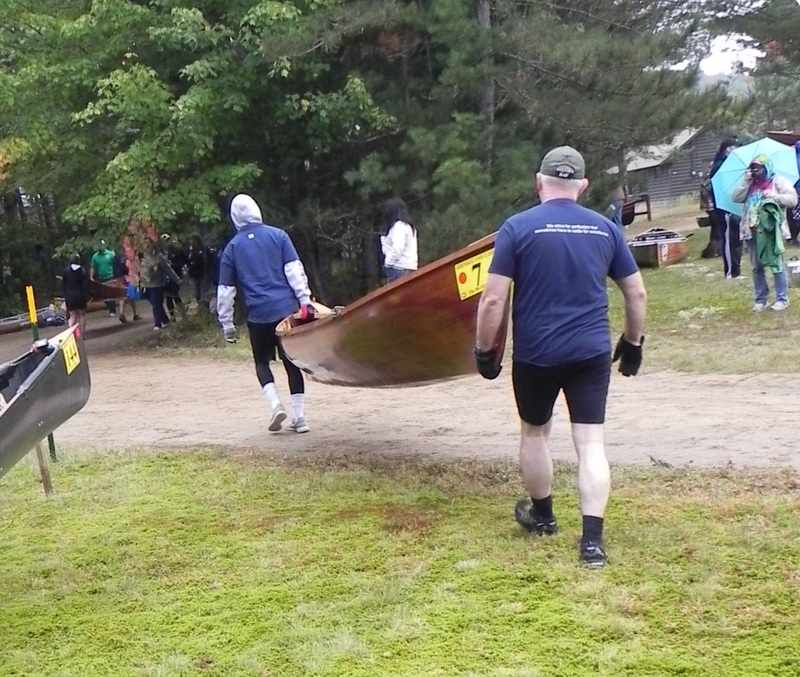 By crabwalking they mean using their oars to push off the bank to keep moving. Another wrinkle was that beavers had erected a dam across the Tract. It sometimes takes more that one try to get over the dam and back in the race. At some point one of John’s oars got jammed against a bank. The forward momentum of the boat caused it to careen around and cracked the gunwale. This slowed down their progress. John is racing with his son Dalton. Emergency repairs were made. Here Jon, the new owner of the guideboat Thankful, views the damage with John. Jon is racing in a four man canoe and, at this point in the race, is in third place by four minutes. 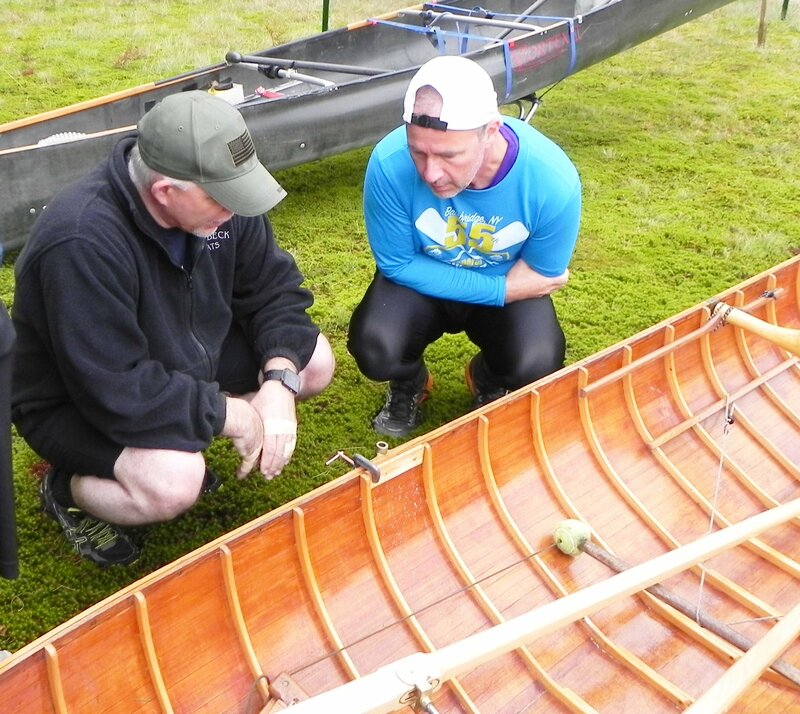 Jon inspects the damage to John’s boat. 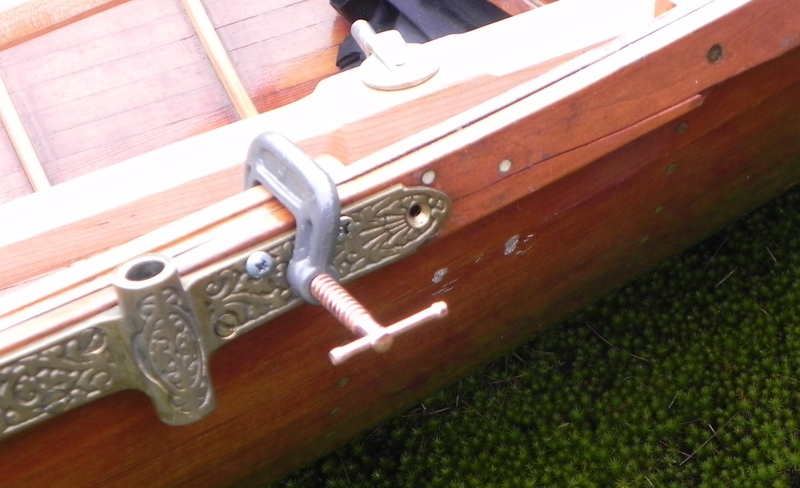 Here is a closeup of the emergency repair made to John’s boat. Emergency repair made to the gunwale of John’s boat. I asked John how long each leg of the three leg race took him. He said probably more than seven hours. That is a whole lot of rowing, or paddling, if you are in the stern seat. 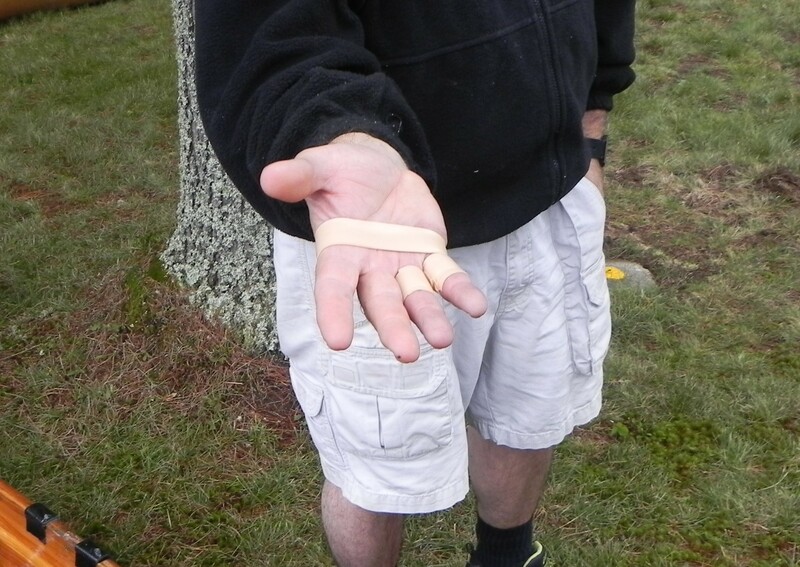 John wears gloves but also tapes his hands to protect against blisters. Blisters apparently don’t bother him. If they pop he washes them in the clean lake water and is off again. 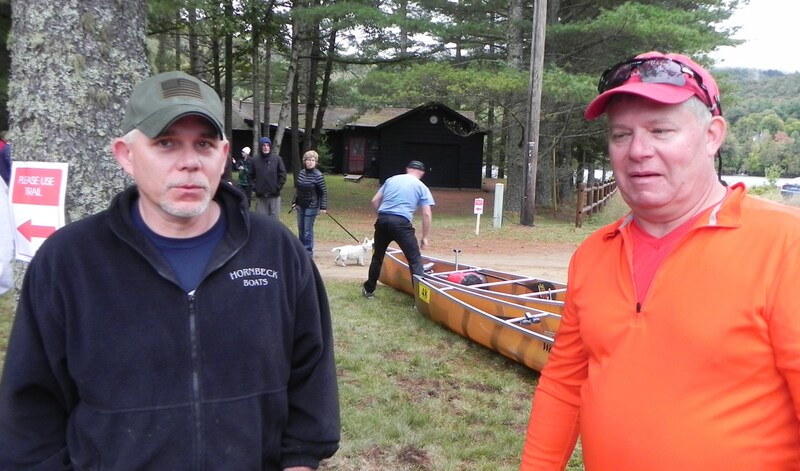 The guideboat “wave” was called and off went John and Dalton on the second leg of the 90 miler. John and son, Dalton, off on the second leg of the 90 Miler. I was impressed with camaradarie of the racers and their upbeat spirit. Great article. Gives me some insight to what the contestants are experiencing. Johns dad and I are very proud of him and our grandson Dalton. Thank you for you kind words. I am glad I could convey some of the experiences the racers see during their journey. It has been a real treat to know John. He is not only very creative but has the daring to go with it.